The Friends of Katahdin Woods and Waters are hosting the sixth annual Head North Ski Days in the north end of Katahdin Woods and Waters National Monument. PATTEN, Maine — The Friends of Katahdin Woods and Waters are hosting the sixth annual Head North Ski Days in the north end of Katahdin Woods and Waters National Monument. The event began Saturday, March 16, and continues through Friday, March 22. With the help of local volunteers and community partners at Elliotsville Plantation, Inc, event attendees are invited to borrow free cross-country ski or snowshoe equipment at the North Gate of the Monument. Friends Education Coordinator Kala Rush will host visitors as well as students from across the Katahdin Region. Through March 22, starting each day at 10 a.m., the public will have access to free cross-country skis, boots, and poles provided by Outdoor Sport Institute as well as snowshoe equipment from the Katahdin Gear Library. Volunteers will help visitors set up equipment and can offer recommendations for enjoying the trails system. Adventurers interested in a backcountry overnight experience are invited to reach out to the Friends of the Katahdin Woods and Waters to plan an extended trip. “Whether you’re out for half a day or a couple of nights, the 16-plus miles of groomed trails offer excellent skiing and snowshoeing with some breathtaking views of the East Branch of the Penobscot, Bald Mountain, Traveler Mountain, and more,” Rush said. Elliotsville Plantation, Inc. started Head North Ski Days in 2014 to showcase what was then a recreation area before the historic land gift that led to the designation of Katahdin Woods and Waters National Monument in August 2016. With support from local Maine sponsors Shin Pond Village, Richardson’s Hardware, and Emerald Builders, Friends of the Katahdin Woods and Waters continue to host the event and offer free equipment for visitors from the Katahdin Region, Maine, and around New England. 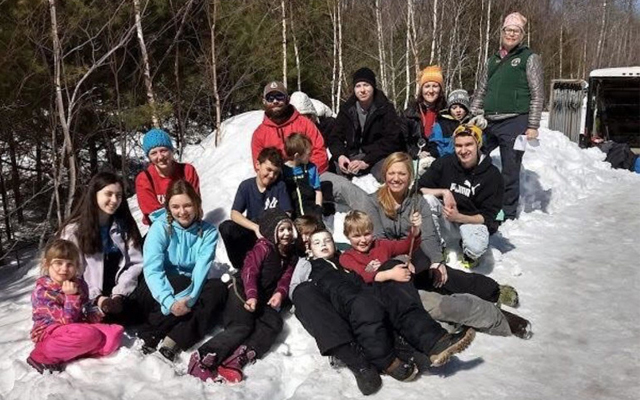 Millinocket radio station The Mountain 94.9 and Big Hits 99.3 in Farmington are supporting the event by broadcasting a Head North Ski Days public service announcement recorded through the Katahdin Learning Project with the help of Katahdin High School students. During Head North Ski Days, students from schools in Millinocket, Medway, Stacyville, and Patten will have the opportunity to enjoy the north end of the Monument with Kala and teacher chaperones. For more information about Head North Ski Days, please visit the Friends website. Friends of Katahdin Woods and Waters is a non-profit 501(c)(3) membership organization made up of individuals and businesses who are committed to the mission to preserve and protect the outstanding natural beauty, ecological vitality and distinctive cultural resources of Katahdin Woods and Waters National Monument and surrounding communities for the inspiration and enjoyment of all generations. To become a member or to learn more, go to www.friendsofkww.org.